This monograph is devoted to Mongolian musical-poetical folklore. The author's study of the genetic and structural features of the Mon-golianfolk songs has resulted in establishing undeniable relations with other folklore genres, the verbal specifics of the Mongolian language, and theinfluence of ethnocultural factors. The main point of the research is the philosophy of the Mongols' musical-poetical perception of, and interactionwith, the world. The author has studied Mongolian folk songs and read manuscripts from the collection of the Department of Oriental Manuscripts and Rare Documents in the Institute of Oriental Studies of the Russian Academy of Sciences and in the Orientalists' Archive of the RAS Russian Academy of Sciences for many years. 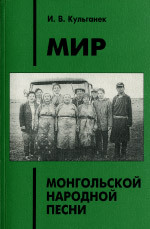 The writing of this book was prompted by a folklore expedition during summer 1990 to Northwest Mongolia, during which the author was able not only to obtain a deeper knowledge of the subject but also to immerse herself in the emotional and musical-poetical world of the Mongols, to hearthe phonation of songs in their natural conditions, to feel the Mongols' unity with their country's nature, and to observe the ancient songs in modern surroundings. The book also deals with the moral, ethical, spiritual and mental values of nomadic people, as well as the worldview, ideology, and attitudes of the Mongols. Some cosmological notions came to the Mongols from ancient times and were adapted to local conditions. One of them — the division of the world into two parts, male and female — influenced the names of strings, timbres and tines in music. However, the names of Mongolian musical instruments and the tunes and legends about them attest to the existence of the original musical, mythological, and poetical conciousness of the Mongols, who absorbed and reappraised the spiritual heritage of their predessors and neighbours. They created their own musical-poetical culture. One can moreover find in the book the history and principles of the fixation of the folk songs and their relations to the Mongolian literary tradition. Some of the chapters are devoted to the central questions of the poetics of the songs, such as the main poetical hero, associated connection, alliteration, parallel, epithet, rhythm, phonic structure, and rhythm-syntactic form. This book is intended for specialists in Asian studies — philologists, ethnographers, and musicologists — as well as general reader interested in the traditional culture of the peoples of Central Asia. The author's own translations of the songs allow the reader to understand and enjoy the highly artistic examples of Mongolian folk songs. On November 11, 2018, at the meeting of the Council of Young Scholars at the IOM RAS, PhD student O. Bonch-Osmolovskaya will read a lecture The Typology of Confucian Commentary.